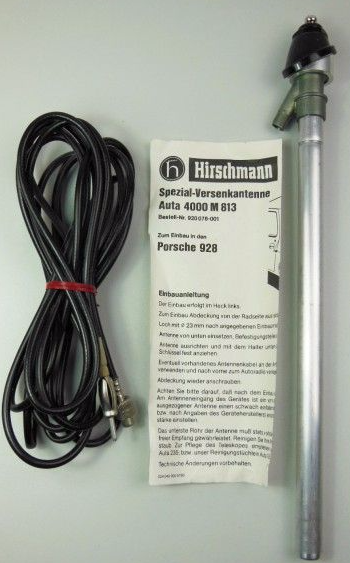 NEW OLD STOCK HIRSCHMANN CHROME MASTED TELESCOPIC, EXTENDABLE CAR AERIAL / ANTENNA. AUTHENTIC FOR 928. THIS IS A WING MOUNTED AERIAL THAT IS LOCKABLE, AND ONLY NEEDS A NARROW IN-WING APERTURE TO INSTALL. SUITABLE FOR MW/LW/FM RECEPTION AND COMES WITH A SWIVEL BALL BASE FOR FLUSH WING MOUNTING.